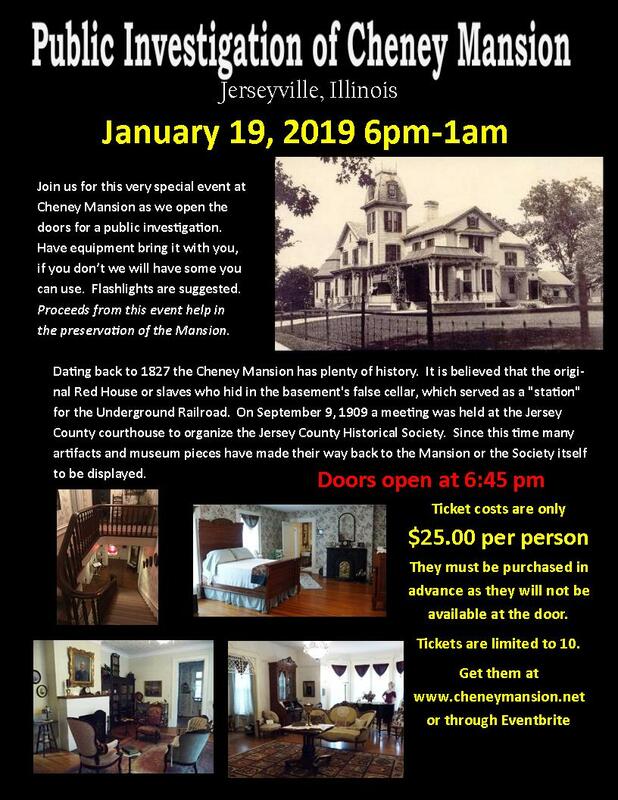 Welcome to an actual ghost investigation in one of the most haunted locations in Southern Illinois, the Cheney Mansion. Are PD Cheney and his nurse still hanging around the Mansion. Maybe you would rather just hang out in the secret little room that is thought to hold slaves during the underground railroad. Whatever your thrill seeking mood is set at we think you will have a great time while investigating this incredible location. Just wandering the mansion and taking in all the antiques is incredible in itself. Get your tickets now as everything sells out fast at Cheney. The money from these ticket sales goes 100% in the upkeep and renovation efforts of the Cheney Mansion. There are no refunds but in the event of weather related problems the date may be moved to 1/26/19.